First off, both have very nice formulas and cover very well in two coats, so I suggest getting whichever looks better to you. They both have slightly duochrome gold glass fleck glitter, but the base color is where they differ the most. Rain Forest has a darker, more yellow-toned base than Glittering Garland's emerald green. For this reason, the glitter seems to "pop" just a tad more in Rain Forest, but it shows up more densely in Glittering Garland. Overall, I say they are similar but not dupes, and it's up to you whether you want both. I like different aspects of each of them, so I don't think I have a favorite of the two. 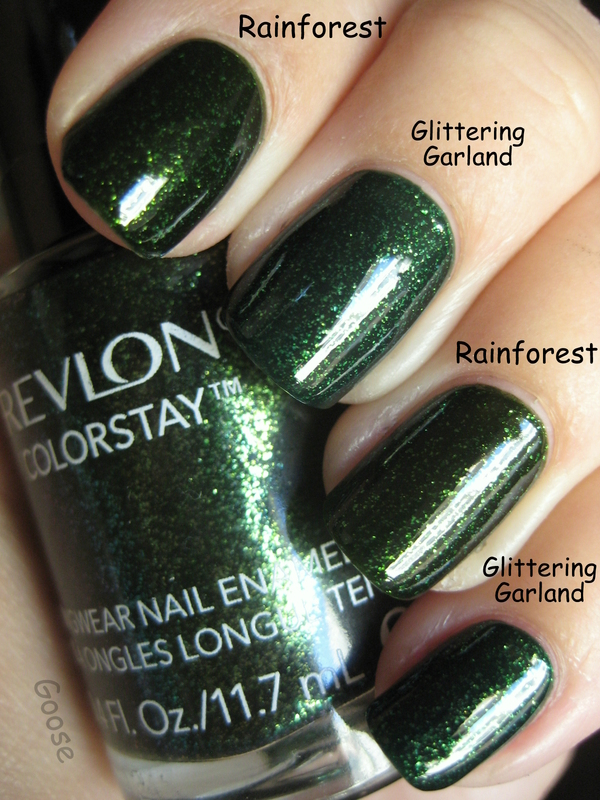 Revlon Rain Forest is now available in most places that carry Revlon like Walgreens, Walmart, Target, and Ulta. Glittering Garland was part of the China Glaze Holiday 2011 collection and is still available on some sites like Trans Design. On a side note, I was super excited when I realized that the sparkles in these appeared to be duochrome in the bottle (I can even see blue and purple! ), but sadly, it really doesn't translate at all on the nail. Oh well. Thanks for comparing these two. I'm so glad they made a similar polish. While I won't be purchasing rainforest, as I already have GG, GG was one of my favorite polishes of the year. This way all those ladies (and gents) who didn't pick it up can at least get something similar! Thanks for the comparison! I look at Rainforest today and I could tell they were similar but not exactly the same. They're both so, so pretty. Thanks for comparing the two. I thought Rainforest was definitely a dupe to Glittering Garland so I passed on it. I may have to reconsider because it's so pretty! Think I'm liking the Rainforest green better! But who am I kidding! I love all greens and own way too many!